Author Yoav Litvin is passionate about street art and recognizes its positive impact on NYC neighborhoods. His first book, Outdoor Gallery, is an expansive collection of the powerful images that punctuate neighborhoods and rally urban dwellers in appreciative response. 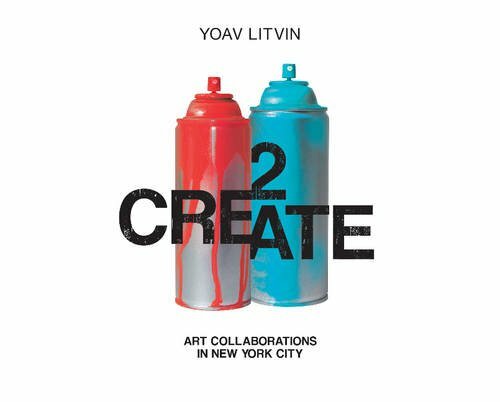 Litvin’s new book, 2Create: Art Collaborations in New York City, delves into the creative process. 2Create shines a spotlight on collaborating pairs with bios in the artist’s own words that present an interesting background comparison. The journey from lone artist to engaged collaborator is revealed in firsthand descriptions of the partnering, how and why it began, and the creative idiom that drives it. The expression two minds are better than one comes to mind as these fiercely talented individuals portray the journey from individual to collaborator. Some pairings are inspired by differences; one artist may be prone to preplanning and drawing ideas on paper while the other is spontaneous, producing on the fly, even embracing mistakes and viewing them as enhancements. Collaborations frequently challenge artists to push against the boundaries of their comfort zones. One may approach this book in the traditional manner, starting on page one and progressing forward. Others may be compelled by the alluring images and choose to forego order and flip through to preview the remarkable art. This book does not rely on sequence to be engaging and can be appreciated in any order. 2Create: Art Collaborations in New York City is an illuminating behind the scenes look into the artists and the creative forces at the heart of street art. These artists collectively engaged in adorning the urban jungle are part of an aesthetic movement in NYC that transforms ordinary locales into artistic milieus. Rhonda Goldberg Sturtz is Marketing and Social Media Director at New York Journal of Books. She owned and operated New Asia Art, a contemporary art dealership.